Kanagawa Prefecture in Japan is home to nineteen main cities of the island nation. As a country that has seen many natural disasters, architecture and design is given great importance here. Leading architects based in Kanagawa Prefecture, Kojikoji Primary Architect Office, are known for remodelling old apartments into contemporary functional homes. 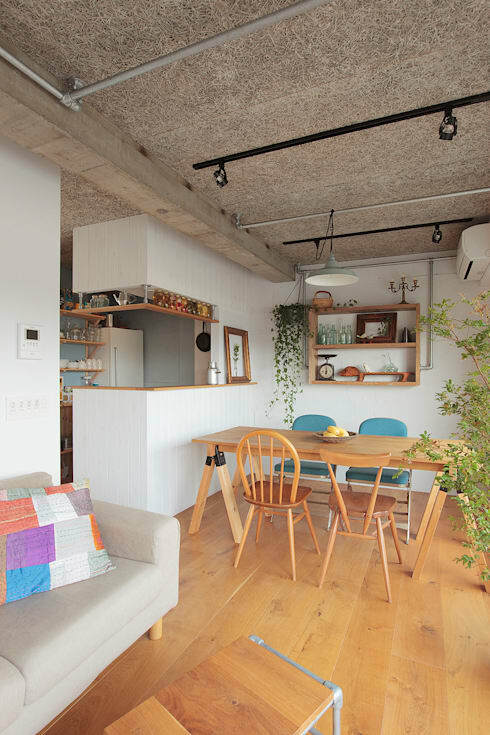 One such remarkable project is Room 402, a compact apartment in Kanagawa Prefecture. The architects have recognised the scope of the space and utilised clever lighting, designs and textures to make it a gorgeous place called home. Read on to know more! 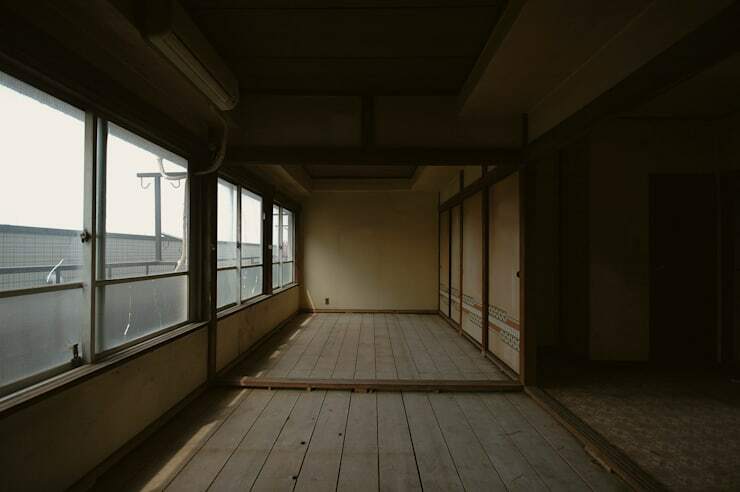 This is the large living area of the old apartment which was engulfed in darkness, despite having windows on one side. The dark coloured walls and the badly panelled floors may have been the reason for this. Bare minimum lighting adds to the despondent picture that this apartment paints! It needed an overhaul that not only could utilise its generous space and scope of natural lighting, but could also offer all facilities needed in a house. Let’s see how this dank, depressing space has been turned into a marvellous home! 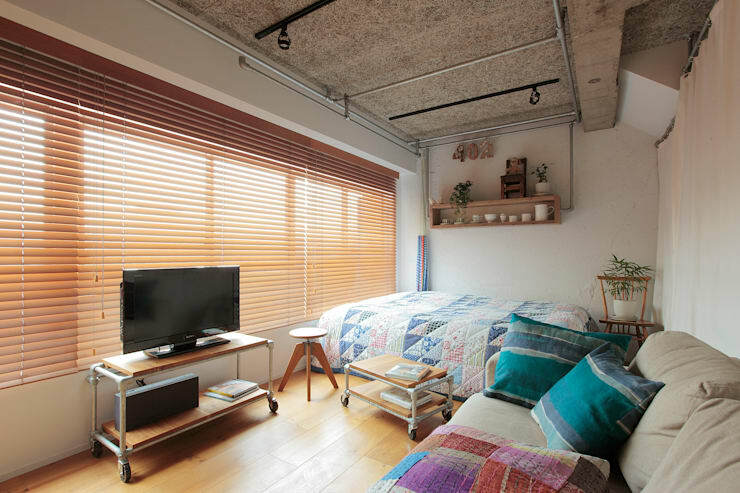 Imagination knows no bounds for these architects who have altered the once dingy looking apartment into this sunlit optimistic home for the city dweller. What a lovely place to come home to after a hard day at work! This space is a compact one encompassing the living area, kitchen and dining area, and bedroom. The walls have been given a white tone to brighten up the place and efficiently reflect the sunlight infiltrating through the long windows. The dank flooring has been given a facelift with light coloured wood panelling that adds warmth to the cheery abode. One end of the apartment has been utilised to accommodate a living area and the bedroom. A television set occupies centre stage, positioned atop a simple modern table. In front of it is set a comfortable, plush settee with vibrant cushions. The setting is an inviting one, encouraging you to indulge in a late night movie or an afternoon lounge with a book. Flanking the sofa on the right is a bed that is covered with a multi-coloured patchwork quilt. Functionality has not been forgotten; small stools placed at the right corners provide room for those odd magazines or the coffee cup. Personalise your bedroom with knick-knacks on the open wall rack above. Since the apartment is compact, simple but utilitarian shelves dot almost every nook and cranny! These are perfect for arranging household essentials, as well as displaying decorative bric-a-brac. 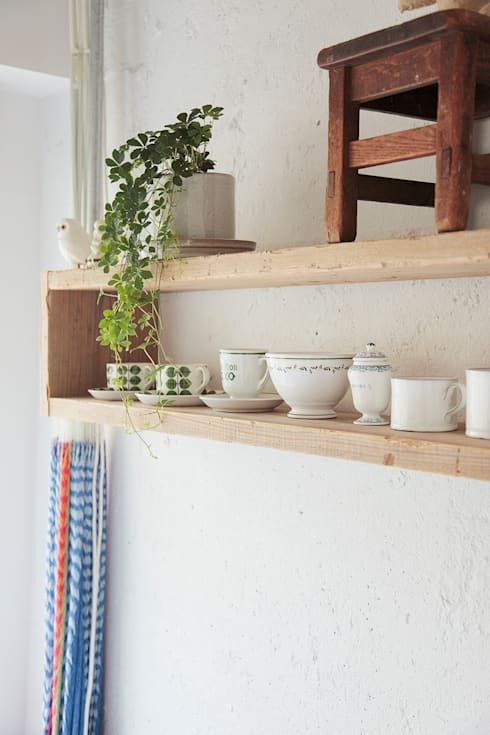 The potted indoor plant decking this shelf adds a touch of nature to the home too. 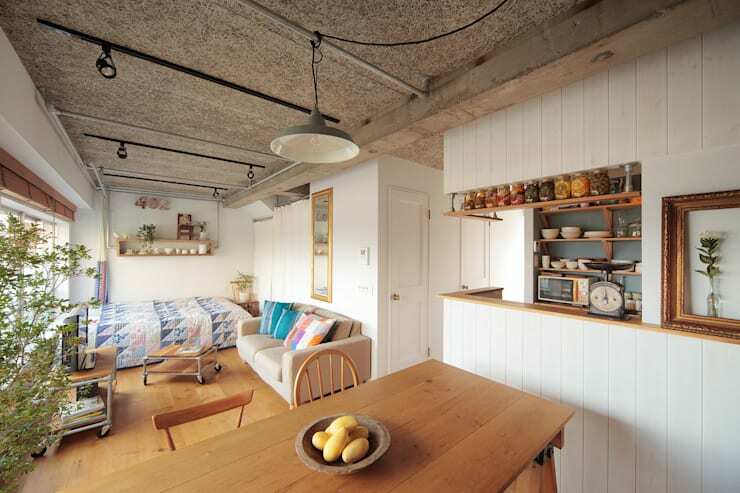 As with most compact apartments, this one too has an open kitchen overlooking the dining area. This part of the room has been magically given a rustic feel, with indoor plants standing proudly as you dine. The open kitchen has a counter from where food can be handed out conveniently. The kitchen and the dining area are conveniently designed near the living area, so you’ll never miss your favourite TV show, even while cooking up a meal. Let’s take a closer look at the dining nook. A home becomes a snug and cosy retreat when the indoor temperature is taken care of. 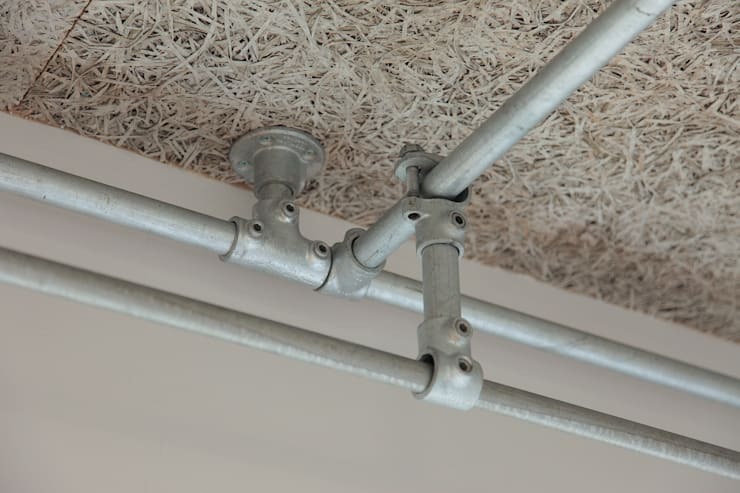 In this apartment, 'wood-wool' board or finely processed wooden fibres have been used on the ceiling for insulation purposes. It also promises excellent sound absorption, and is considered a better option than plywood. The table itself is a charming affair in light coloured wood, imaginatively mismatched chairs, with even a touch of blue on one side! This dining space exudes a Mediterranean picnic spot-like feel with its quaint look. 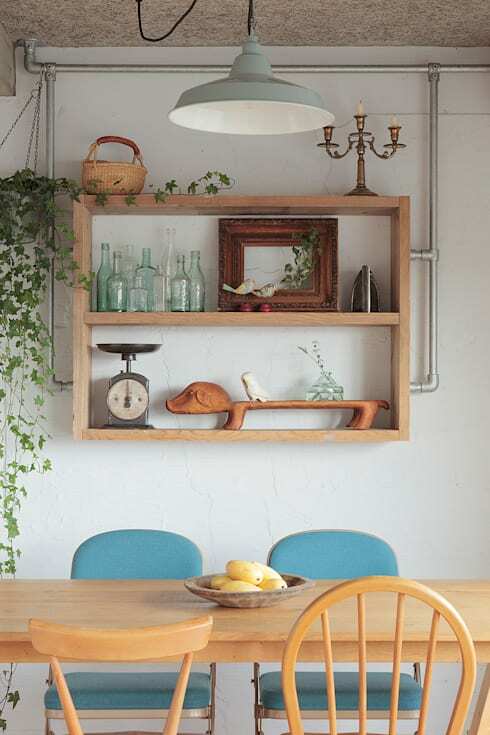 Check out the little dachshund-shaped holder on the wooden wall rack, along with a candelabra, quirky glass bottles, a cane basket, a wooden frame and a weighing scale for fruits and vegetables. A touch of green comes from the hanging pot. The table is lit with a practical lamp overhead. 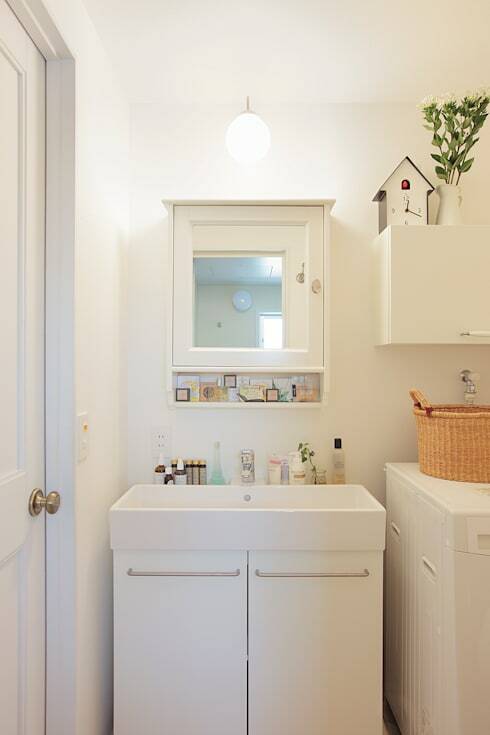 The little space for the washroom is well appointed with a mirror cabinet and washbasin. Adequate storage beneath the basin takes care of those towels and toiletries. The delightful space has some nature thrown in with a plant atop the shelf. A washing machine has been magically fitted into this space too. You may lose track of time here, so the quaint cuckoo clock on the rack serves as a reminder! Elegance with a quirky personal touch thrown in has turned a shabby apartment into a charming space for compact and stylish living. We hope this makeover story has inspired you for your own remodelling project! Here's another before & after ideabook if you are still not satisfied: From building site to brilliant: a small apartment shines again. Which of the gorgeous decor touches do you like best? Can you imagine living here? Let us know in the comments!